I'm working on what the trendies and hipsters call a 'long read'. It's about Neoliberalism - what it is and what's likely to come after. I'm about 2,000 words in and not sure if the mid-point has been reached. Yikes. I've been making cups of coffee since I was a little kid, mostly for myself and mum. And I followed the standard prep format. Coffee and sugar in first, followed by the milk and then topped up with boiling water. Seeing the half/semi-dissolved granules swimming about the surface was, in my book, the sign of a drink well made. Then, over 20 years ago, I went to university. In the second year our house was in a street about two minutes walk from the main entrance to the ivory tower, so all the folks we knew would pile round inbetween lectures. Many hours of Neighbours and Home and Away were spent with cakes from Wright's Pies and beverages from, well, me. And I recall one of my housemates (hello, Liv!) 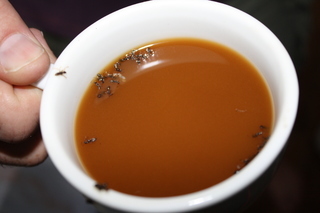 moaning about my "ants in the coffee". Imagine my horror that, apparently, the trusty and tried Cartledge way of doing things was wrong. The water goes in first and the "ants", my beloved melting coffee sands, were unworthy. Sad to say, I capitulated and adopted the "proper" method and have added the milk last ever since. a) How do you make your (instant) coffee? b) Is it a region thing? c) Is it a class thing? This has puzzled me for the best part of 15 minutes, so can you shed some light on the situation? Worth remembering that milk in coffee, as opposed to cream, is a relatively modern habit. The traditional working class substitute was condensed milk, which worked better if you mixed it with the coffee granules (or old-style liquid, like Camp Coffee) before adding water. Water, boiled but just off the boil, in first. Then (if you must) sugar, then (if you must) milk or cold water. Is it a class thing? No. Is it a regional thing? No. Our Sunday luxury was "Milk Coffee", made with a teaspoonful of Camp "coffee" (actually made from chicory, which was one of the alternatives to coffee that had been used during the war) and topped up with boiled milk (that nearly always boiled over the saucepan). I suppose you'd probably pay a tenner for it today, if it was called a latte or something pretentious! Haven't made an instant coffee for about 20 years since I discovered firstly the cafetiere and later Mussolini's only positive contribution to civilisation the Moka Pot. When I did I would always put the milk in first. Now I do the student cappuccino thing of adding milk last after vigorously (and occasionally disastrously if you haven't properly secured the lid) shaking the bottle to froth it up. My Scottish Gran loved Camp Coffee and the now vanished Italian cafe in Museum St where I used to have my lunch when I lived in London did an iced camp coffee which I actually preferred to real iced latte. Milk in Coffee is an aberration as far as I'm concerned. Will be interested to read your blog about Neoliberalism - my hunch is that some of its critics don't really like liberalism (neo or otherwise) and conflate many disparate phenomena (a broadening of individual liberties, moves against corruption which are often very successful, economic deregulation and the erosion of workers rights, the marginalisation of Trade Unions and other organisations representing the worst off in society, loosening enviornmental protection, increasing disparity between rich and poor). The first two are positives...the rest are not. I have always thought that "neo-liberalism" was a mirage. I'd call it what it really is - conservatism. If it that long on that subject then give it to Open Democracy to publish or co-publish? True X drink tea not coffee. Milk in first, add the coffee and sugar, stir wll, then the water. Gone Tassimo now. First you go to Facebook then you start posting Clickbait. It's a slippery slope. I don't drink instant coffee and that's a taste thing not a class thing, but when I did it was milk and coffee first, followed by water that boiled about a minute or two before. Because that's the way to make it. Putting the milk in last makes it easier to judge whether you've used the right amount. Yes Mat, expect some Canary-like headlines very soon! Believe me, there is something weighty in the wings. Hopefully one more push tomorrow night should deliver this beastie into the world. "Hopefully one more push tomorrow night should deliver this beastie into the world." Eh, if you take your time it should guarantee that it'll be ram-packed with insight. You add milk to tea first as this gives a sterilization effect to the milk. This requires a keen eye to get the right colour. Leaving the tea bag is a consideration, if using the superior Earl Grey. Coffee is a different matter as 'off the boil' is the only way to make coffee as you will kill it otherwise, so milk goes in last. Black coffee is different than coffee with milk because coffee with milk is shite. A Tassimo appears to be the way forward but percolated coffee is preferable. A Tassimo from argos £100 but JTF have them on offer at around £35 with their re-supply £1 per box cheaper than anywhere else, VAT free.